There’s Airbnb, and then there is everyone else. 2015 saw an all-time funding high to travel tech, buoyed by big deals like the $1.5B Series E to Airbnb and the $300M Series E to China-based TuJia. Deal count also surged. Travel tech startups are changing lodging, consumer booking (for flights, hotels, etc. ), fare alerts, and much more in the broader travel category. CB Insights dug into the data surrounding travel tech investment trends, including deals and dollars breakdowns, most well-funded companies, and most active investors. We defined travel tech as tech-enabled companies offering travel-related services and products, including booking services, search and planning platforms, on-demand travel, and recommendation sites. 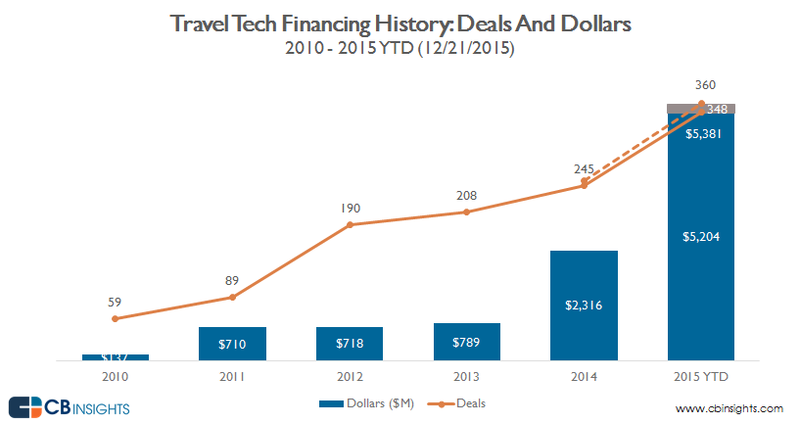 Financing activity to travel tech startups exploded in 2015. Funding reached more than $5.2B across 348 deals through 12/21/15, and is projected to reach almost $5.4B across an estimated 360 deals by year-end. In terms of deal activity, deal count is at 348 deals, which is up 42% over the 2014 full-year total, and up 490% over 2010 deal count. Dollars invested also saw a large jump, with 2015 funding year-to-date growing 125% over the 2014 year-end total. Notable financings in the year include the $1.5B Series E round to Airbnb and the $300M Series D round to TuJia Online Information Technology, which is a China-based vacation rental platform. 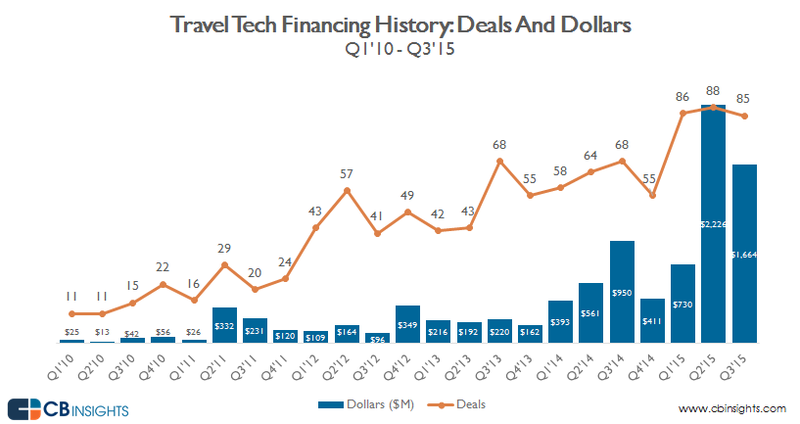 The last two quarters combined for roughly $3.9B dollars invested in travel tech startups. Q2’15 hit an all-time high in deals and funding at $2.2B dollars invested, across 88 deals. Additionally, 4 out of the last 5 quarters each saw $700M or more dollars invested in the category. The higher deal volume is brought into sharper focus when looking at this year’s quarterly trends compared to last year’s. Each of the last 3 quarters saw 85+ deals completed, compared to a 55 to 68 quarterly deal range in 2014. The Seed/Angel stage dominated deal activity, accounting for more than half of all deals completed since 2010. 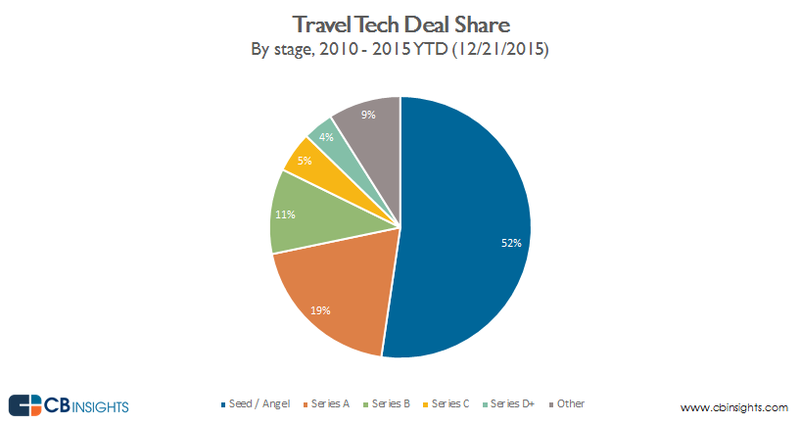 Overall, early-stage rounds (Seed/Angel and Series A) took 71% of deal share to travel tech startups. Mid-stage deals accounted for 16% of deals in the six-year period, while late-stage deal activity (Series D+) accounted for just 4%. When looking at dollar stage, the picture flips. Late-stage (Series D+) investments have commanded the plurality of dollar funding to travel tech companies since 2010, accounting for 35% of dollar share. Mid-stage dollar share also saw significant investment and accounts for 31% of all funding. Finally, early-stage (Seed/Angel and Series A) dollar share attracted 16% dollar share, despite attracting over two-thirds of deals, as seen above. 500 Startups tops our list as the most active investor in travel tech startups by the number of unique portfolio companies in the space. Some of their investments include travel-centric social network Tripoto and ground transport search engine Wanderu, among others. The following two most active investors are Accel Partners and SV Angel, as seen below. 500 Startups was also the most active early-stage investor in travel tech startups. Rounding out our top 3 spots are SV Angel and Plug and Play Ventures. Two of the the top 10 most well-funded travel tech startups have raised more than $1B in total funding to date. The list includes notable unicorns like Airbnb, TuJia, and South America-based flight- and hotel-booking site Decolar. 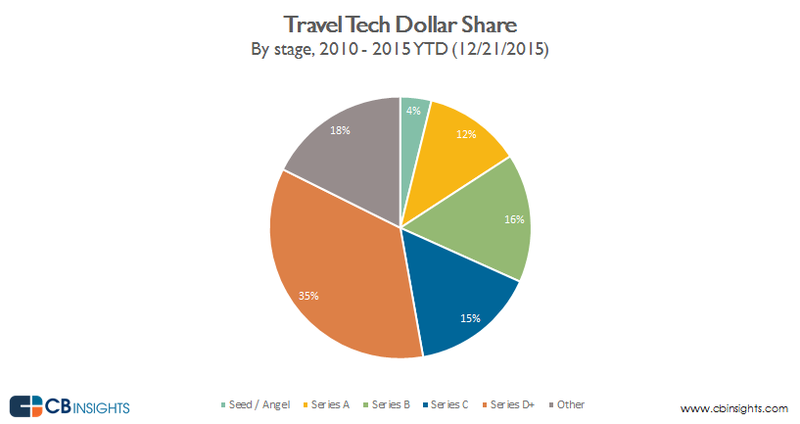 For the full list of well-funded travel tech startups, see below.